SIKO GmbH: The requirements for sensors used for position detection in automation and drive technology increase with the complexity and performance of the associated machines and systems. A new MSA213C high-resolution absolute sensor from SIKO is a perfect solution. It not only supplies the absolute position at any time without referencing and without requiring a backup battery, but thanks to its small design and many different interfaces, it can also be integrated into the system and control environment with very little effort. The MSA213C, with its high signal quality and small dimensions, is ideal for use in handling and assembly automation, machining systems, pick-and-place applications or PCB processing. The MSA213C is also an excellent choice for precise position detection and speed measurement in linear direct drives. The magnetic absolute linear encoder impresses with its high absolute resolution of 1 μm, ensuring precise position detection at all times. Absolute measurement is essential, especially in safety-relevant applications when a change in position has to be reliably detected, even if power is off. The repeat accuracy achieved of ± 1 μm enables reliable use in multi-axis applications or positioning systems where exact control and position recognition is required. It achieves this performance level over a length of up to 16 meters. The MSA213C is available with many different absolute interfaces so that it can easily be integrated into the application by the customer. Even in the basic versions with SSI, RS485 and BiSS-C, the sensor is also available with IO-Link and supports protocols from various control unit manufacturers. In addition, an incremental interface is available in parallel as a digital line driver or analog 1 Vss signal output. This combination provides absolute position information at all times and ensures exact commutation even in dynamic operation. A function and status LED is included in the housing for installation and operation purposes. The small, compact design of the sensor, which allows easy integration into the target system, also deserves to be highlighted. 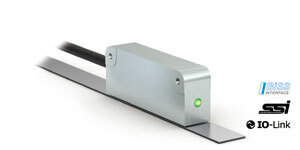 The large reading distance of up to 0.8 mm and low space requirements ensure the user can integrate the sensor in the geometry and the available installation space of the system. The small size of the sensor is also remarkable in light of its long measuring range of 16 meters, resulting in a wide variety of possible applications.